It’s not déjà vu. 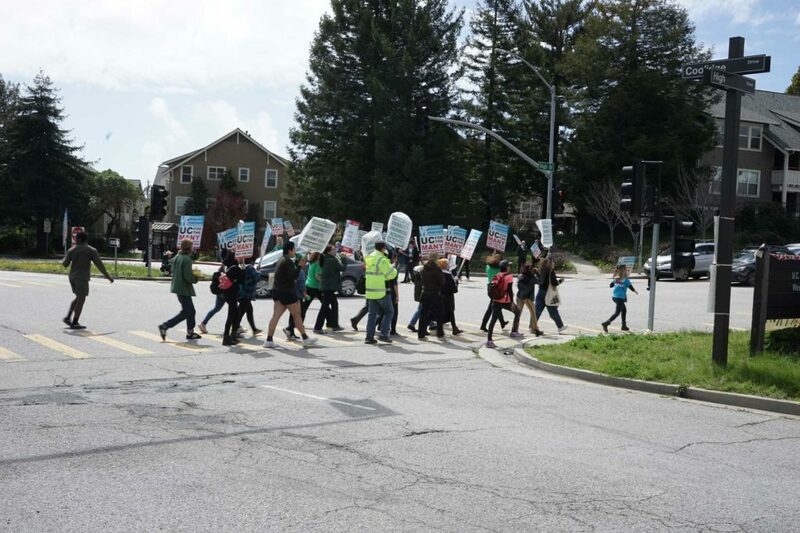 Picketing from early morning to around 4 p.m. at the main UC Santa Cruz entrance, dozens of UC employees joined their counterparts statewide on March 20 to strike over a dismissal of union bargaining. The third UC workers strike in less than a year, it’s one in a Greek epic of union campaigns to reach a contract agreement with the university. The United Professional Technical Employees-Communication Workers of America (UPTE-CWA) 9119 led the demonstrations. The union represents about 13,000 research, technical and health care workers across the UC system, with members holding job titles ranging from nurse to classroom IT worker. About 24,000 members of the American Federation of State, County and Municipal Employees (AFSCME) Local 3299, the largest UC union, joined the statewide UPTE-CWA demonstrations in solidarity. At UCSC, students and members of the Worker Student Solidarity Coalition (WSSC) bolstered the ranks. About 75 people gathered near the base of campus over the course of the day. The strikes came after the UC declared a good-faith impasse in its negotiations with UPTE-CWA’s research (RX) and technical (TX) units mid-February. In other words, having failed to reach an agreement within the 18 months since the units’ contract expired, the UC concluded further negotiations would be unlikely to result in either side ceding ground. Current RX/TX contract demands include wage increases of 5.5 percent per year through 2023 and guarantees to leave current health care and pension plans untouched. The pension terms come after the UC began allowing workers to divest from UPTE-CWA’s proprietary pension fund and opt instead for 401(k) plans. In contrast, the UC’s final contract offer promised wage increases of 3 percent per year, but at the cost of giving no health care or pension plan guarantees. According to the UPTE-CWA website, the impasse move grants the university free reign to impose its own contract term proposals without union consent. Union officials cited a similar bargaining maneuver during the UC’s negotiations with the AFSCME 3299 Service and Patient Care Technical units last year as evidence of a hardball playing field. Claire Doan, a spokeswoman for the UC Office of the President (UCOP), called the strikes “organized theatrics” in an email. “Three disruptive strikes in less than one year come at a cost to everyone — patients, students and UC communities — while doing nothing to help unionized workers get closer to a contract and wage increases,” Doan said in an email. Staged during finals week, the strike resulted in exam reschedulings due to daytime city buses ceasing service through campus. The Porter/Kresge and Crown/Merrill dining halls were closed all day. The UC-employed UPTE-CWA members are already paid competitive salaries at or above market rates, with clinical research coordinators earning an average of $64,764 per year, and pharmacists clearing $167,708, said Doan. But she did not fully address the main issue at the finals week strike, labor outsourcing. While the UC is barred from contracting out labor for the sole reason of cost savings, it is not prohibited from deterring workers from seeking long-term employment via underwhelming wage increases and benefits. With its slew of recent projects developed in partnership with private firms — like the new UC Davis rehabilitation center in Sacramento and the Student Housing West development at UCSC — workers fear the UC will become less reliant on union labor. UPTE-CWA workers are trapped in a loyalty dilemma.